Wow, episode 20. I feel like I should bake a cake or something. I am working on some site stuff, so if you come back soon and things are broken, don’t worry. It will be better soon. This week, I mostly talk about Brian K Vaughan’s Ex Machina. I found this to be really cool. Sort of in a long haul way. I had been reading Secret Wars, and not really getting into it, so I picked this up and time just passed. It didn’t blow my mind, or change my worldview, but it is, so far anyway, a cool story with solid, expressive artwork. The characters are all people I want to know more about, and the way they are drawn gives them a unique life. At the back of the book Tony Harris does a little “how to” and shows the basics of the process. I thought the filmic way he does his mock-ups was really cool. At the end of the first volume, I wanted more. I actually picked up the Deluxe Hardcover, so take that as a sign that I am ready to invest. 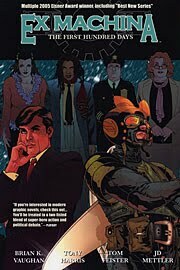 The second Deluxe Hardcover is due out this winter, so expect a revisit when I have more of this series under my belt. Like I said, I’m working on Secret Wars. This is a heck of a book (not really in a good way.) It is so weird and blatantly a commercial for toys that it’s kind of hard to just read. I will keep trying to work my way through it though, if only to read about Spider-man’s Alien Suit origin. Man though. I find that I just want to read something more interesting. If I can actually get through it, and have a different opinion on completing it, I’ll let you know. Lastly, I went and saw GI Joe. I am almost afraid to say that I had a good time. It wasn’t the best thing ever, but it was fun. I am so spiffed that Heavy Duty was so important. I love that actor, and I was excited when I saw him on the cast list. I also really want to be Scarlet when I grow up. Or at least I want a crossbow. That thing was awesome, if totally cheeseball. So yeah, I guess you could say I liked it. So far, most of my customers have not. A couple of guys are actively mad that this movie ruined their child hood, or at least their favorite character. What do you guys think? Love or hate? Thanks for the Ex Machina review. This has been one of the top trades I get, and I will be sad to see it end soon. As always, you do a wonderful job. Keep 'em coming!